Ready to see what you can expect from the Online Course Success Summit? Register for FREE today and get your ticket to The Online Course Success Summit ($997 Value). Save your spot now to get your front row seat for the virtual event kick-off on April 23-25th, 2019! Learn How To Create, Market, Sell Your Online Course From Experts Who’ve Done It! 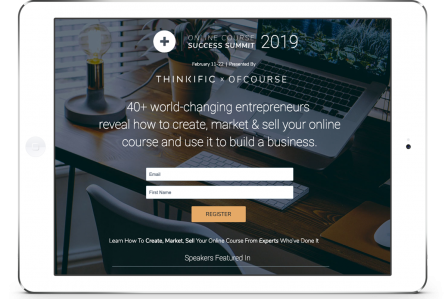 We’ve brought together 60+ of the world’s most influential entrepreneurs to teach you the 3-step approach to create, market & sell your online course. Whether you're just getting started or you've been creating courses for years, you will walk away with actionable tips and tools to exponentially grow your audience, build an impactful course and generate consistent passive income. This Online Event Provides You With Proven Systems And Strategies To Build Your Business, Brand, and Audience. We've hand-picked the speakers and influencers at the top of their game including some of the most successful digital entrepreneurs in the world. These experts are teaching from experience, not only from theory. Check out the incredible line up for yourself below. Fair warning, you might want some sunglasses... there's a lot of brilliance in one place! Although most conferences cost thousands of dollars, we've given everyone complimentary access to all of the summit content. Yes, really! You can catch all 50+ informative sessions for free from the comfort of your home, no travel or pants required. Need we say more? All you need to do is claim your ticket. Each presentation will stream free for just 3 DAYS, and then it will be locked up in the Online Course Success Summit Vault. Save your spot now! Discover years worth of invaluable business knowledge, experience, and strategies directly from the people who've been in your shoes. Most people spend years trying to "figure it out", through this event you have the opportunity to learn directly from successful entrepreneurs and course creators who have overcome the same struggles and obstacles you're currently facing in your journey. The speakers we've hand-selected will empower you by teaching you what really works and how you can immediately implement effective tools and strategies in your business. No Boring Talking Heads Here! Tune into real, raw, and authentic conversations about in-depth topics, powerful takeaways, and learn actionable advice that will positively impact your work today. Ready to learn from 60+ industry leading experts how to Create, Market & Sell Your Online Course? You won't want to miss the biggest online course event of the year! You get complimentary access for a limited time only, save your spot now. The Aspirational Course Creator: You are a coach, consultant, blogger, speaker, or small business owner and you want to build your credibility and more leads. You've heard that having an online course can grow your income and your business. But how? Speed up your path to success with a course. The Work-in-Progress: You’ve been sitting on a half written course for months, sometimes years. You just can’t bring yourself to complete and publish it. You don’t have the knowledge, and quite frankly, you’re a little scared to put your course content out there. This event will help you get past the finish line! The Existing Course Creator: You already have a course or maybe even multiple courses but you’re having trouble selling them. Perhaps you’re struggling to make it to the next level with your success and income. Who knew there was so much to marketing? This event will be the push you need to take things up a notch. The Side Hustler: You’ve tried multiple times to start a side business or something that brings in passive income but, up until now, most of those “experiments” have failed. A course is your first step to making passive income and growing your confidence to take on bigger challenges. It's time to finally get that side business off the ground and share your unique knowledge and experiences with the world! The Seasoned Entrepreneur: This isn't your first rodeo. You've already had some success with online courses, but are ready to learn more in depth strategies for marketing, increasing your student engagement, higher course completion rates, and back-end sales. Level up by learning from other successful course creators! Wherever you are! Because this is an online event, there is no physical venue and no travel expenses. You can watch anywhere with an internet connection... No pants required. Once you claim your free ticket, you’ll receive login info to access all of the talks as they are released. Simply login and follow the easy instructions we give. You’ll be able to view the sessions on any computer, tablet or mobile device for 72 hours after they go live. Yes, the recording for each session will be available for 3 days following the session. Watch it anytime at your convenience during those 3 days, or you can purchase to get access to the interviews & bonus material forever. Claim Your 72 Hour Complimentary Access To The Online Course Success Summit Today! Dr. Carrie Rose is an Educator, Entrepreneur, & Speaker, notably, one of Huffington Posts Must Follow Women Entrepreneurs, and one of Thinkifics Experts. She holds an Ed.D in Educational Leadership from the University of Central Florida, wrote her doctoral dissertation on Professional Development, and is best known for her innovative teaching strategies & methodology, her current research is in course completion rates & connecting online course development with The Science of Learning. Her methods have been shared with Neal’s Yard Remedies, The National Main Street Organization, JetBlue and more. Currently, she works with entrepreneurs, online marketers, and businesses around the country to provide the highest quality of learning strategies with the greatest amount of impact on a variety of different platforms.
" I believe everyone should be given fair opportunities and the tools to build a life worth living. " Lechon Kirb is a Media Strategist. Co-Founder at Ofcourse, Co-Creator of The Online Course Success Summit. Forbes, Red Bull, Universal, NBC, BET, VH-1, PBS, Smirnoff, Master Of The Mix, Hootsuite, Buzzfeed, Holstee, Huffington Post and more.
" I believe your story has the power to set hearts on fire and impact the world in a profound way. " to The Online Course Success Summit Today! The Online Course Success Summit is a new and innovative global community of online course creators dedicated to sharing the tools that you need to finally find success with your online business. We built this summit because we believe that online courses are one of the most lucrative and impactful ways you can share your message with the world. However, there are many things you need to know in order to be successful. So, we partnered with Thinkific, the world's most powerful platform for creating, marketing and selling online courses and membership sites. 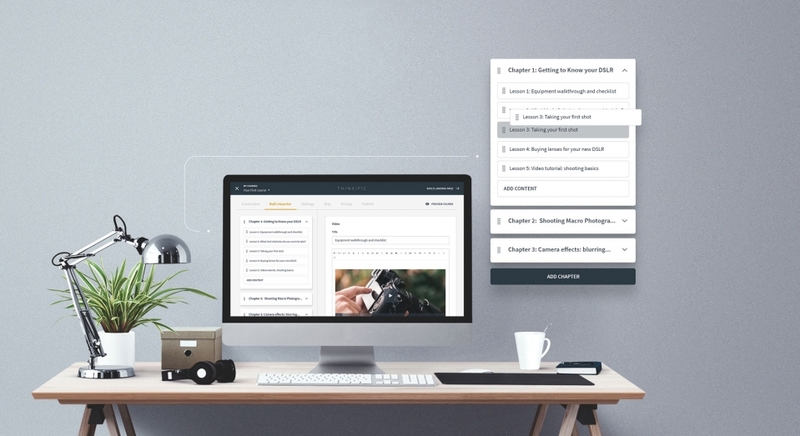 Thinkific has helped over 35,000 course creators create online courses reaching more than 16 million students, and generating over $200 million in sales.